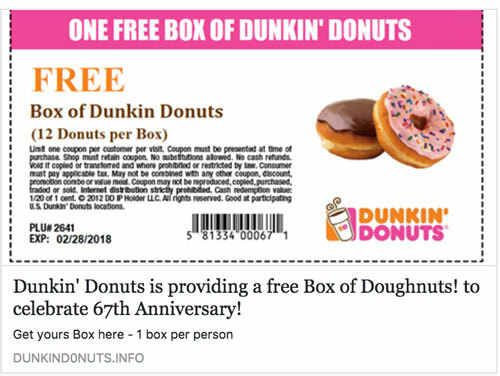 Dunkin' Donuts is sounding the alarm, warning a clickable coupon that's spreading online is fake. The post claims you can get a free box of doughnuts to celebrate the company's 67th anniversary. Dunkin' Donuts was founded in 1950, and is marking it's 68th anniversary this year. Michelle King, a spokeswoman for Dunkin’ Brands Group Inc., said in an email that the online offer is not affiliated with Dunkin’ Donuts. If you see this link, don't click it! The link takes you to a three question survey about the chain. You're then urged to share your results on Facebook and provide more personal information. One sign this is fake is at the bottom of the post it says the website is DUNKIND0NUTS.INFO. Most big companies have a .com website.